The new version of Ubuntu was released last week on Thursday (29th October 2008) with Ubuntu 8.10 “Intrepid Ibex”. There have been many talks and reviews about the new release and people even think it’s a more stable release than 8.04 – Hardy Herring which was designated the Long Term Support (LTS) edition. I wanted to hold off from installing the new version because previous versions needed time to back port all the applications before I considered it useful. then follow the on-screen instructions. The whole upgrade process took less than 20 minutes. rm -rf .gnome .gnome2 .gconf .gconfd .metacity from the LinuxFUD site. Once I rebooted all the settings took effort from the upgrade to the default Gnome settings. I restored the Gnome settings so I can see what the new version looks like as if it was new. Once the login popped up, there was no sound! I logged in and the sound was muted. I unmuted it but there was still no sound. I ran through the tests in the Sound settings and nothing. I tried all the sounds settings but it still didn’t work. What ended up happening was the master volume was unmuted but all the other sound controls like PCM, PC Speakers, Mic, Line In, etc was muted and volume was all set to the bottom (off). 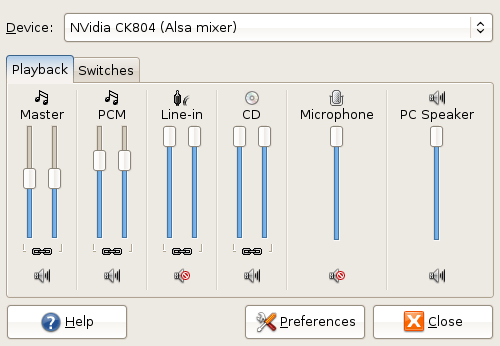 These can be found in the Volume Control (Right click volume control in the panel). I.T software professional always studying and applying the knowledge gained and one way of doing this is to blog. Danny also has participates in a part time project called Energy@Home [http://code.google.com/p/energyathome/] for monitoring energy usage on a premise. Dedicated to I.T since studying pure Information Technology since the age of 16, Danny Tsang working in the field that he has aimed for since leaving school. View all posts by Danny →	This entry was posted in Linux and tagged Desktop, Gnome, Intrepid Ibex, ISO, Linux, LTS, MacBook, PC Speakers, server, Ubuntu, Updates, Upgrade, volume. Bookmark the permalink.